The coDiagnostiX™ app for your iPad® allows you to connect with other coDiagnostiX™ users and to receive and display coDiagnostiX™ planning data. 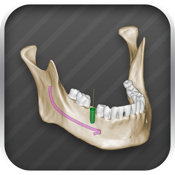 Give the patient a stunning presentation of your planning using the Apple iPad®. Exchange data with colleagues “over the air”. Check your planning data while you are on the road. coDiagnostiX™ app is part of the Straumann® CARES® caseXchange™ communication platform. This app comes with two demo patients. Use them to test the app even if you are not connected to coDiagnostiX™. *) Requires coDiagnostiX™ 8 or higher.